URBANA, Ill. - Each spring the College of Agricultural, Consumer and Environmental Sciences recognizes faculty, staff, and graduate students who have demonstrated outstanding achievements or exceptional service to the college. Recipients are honored at the annual Paul A. Funk Recognition Awards Banquet. 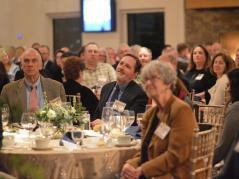 This year, the banquet was held Monday, April 9, at Pear Tree Estate in rural Champaign. The awards program was established in 1970 by the Paul A. Funk Foundation of Bloomington, as a memorial to the late Paul A. Funk, who attended the college as a member of the class of 1929 and devoted his life to agriculture.